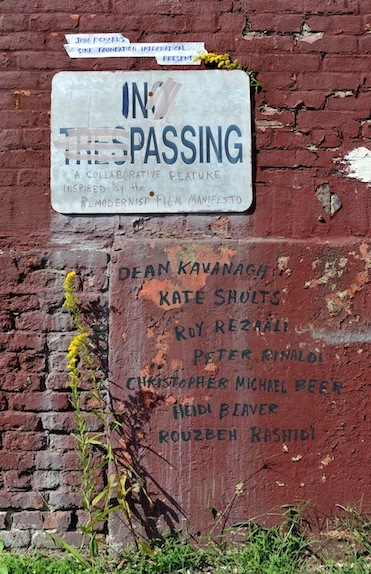 Seven filmmakers from The Netherlands, Ireland, Iran and America, have come together, inspired by Jesse Richardsʼ 2008 Remodernist Film Manifesto, to create a collaborative feature film called “In Passing”. In his manifesto, Richards calls for a new authenticity in cinema, a collective embracing of our flaws, a mass turning inwards. The inspired response from filmmakers all over the world sparked the idea of bringing a selection of them together to each contribute a short film that would all be combined to form a joint feature with no common theme except the inspiration sprouted from Richardʼs 15 point message. The results were distinctly unique yet connected, creating not a narrative, but the unfolding of a collective essence. The finished film is a unique cinematic experience; transfixing, beautiful, meditative and at times deeply personal. Bill Mousoulis from Senses of Cinema was the first to write about the film: “...In an age where digital technology has given rise to a proliferation of filmmakers with nothing but commercial dreams in their heads for their moribund creations, this Remodernist group of filmmakers is dreaming and believing in something else. And actually doing it...IN PASSING is an intriguing and exquisite work..."